When someone throws up on the carpet, it’s important to act quickly to lessen the likelihood of stains. The acid in vomit can also be damaging to carpets, but it can be removed fairly easily if you act fast. 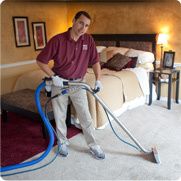 If in doubt, call in the professionals at BCS at 801 561 1730 – we’ll have your carpet restored in a jiffy.